Home » Service Manual Catalog » EPSON Service Manuals » InkJet Printers » SM_ET4550 I have paid for Reset Key but not received yet. Epson ET-4550, L655, L656 printers Service Manual and Connector Diagram New! 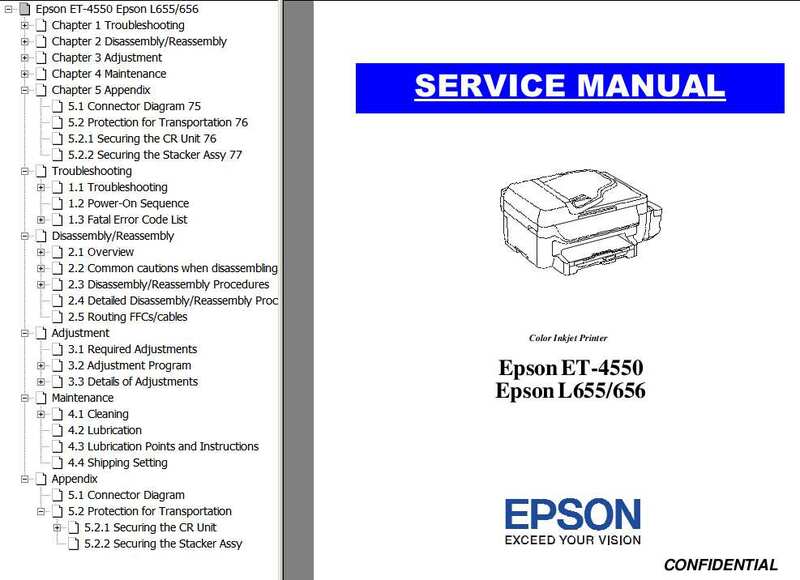 This Epson ET-4550, L655, L656 Service Manual describes basic functions, theory of electrical and mechanical operations, maintenance and repair procedures of the printer. This manual, consists of the following chapters, is intended for repair service personnel and includes information necessary for properly performing maintenance and servicing the product. Describes the step-by-step procedures for the troubleshooting. Describes the disassembly/reassembly procedures for main parts/units of the product, and provides the standard operation time for servicing the product. Describes the required adjustments for servicing the product. Describes maintenance items and procedures for servicing the product. You are magic man. I have downloaded adjustment program and resetted the waste ink counter. Thank you so much for prompt service! Dear sir plz help for Epson T60 Service Adjustment Program FULL Working New! plz confirum t50 t59 service adjustment program work for t60? Notify me of updates to Epson ET-4550, L655, L656 printers Service Manual and Connector Diagram New!